The DFT® Model GLC Silent Check Valve is a spring-assisted, center guided, in-line, flanged check valve that provides reliable, low maintenance service for a wide range of fluids and pressure / temperature combinations. The valve consists of a body, seat, spring, disc with stem and guide bushing. 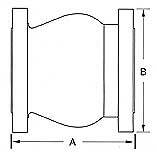 Some valves have body or gasket seals. The DFT® GLC Check Valve has the advantage of minimum pressure loss with silent, non-slam operation.